TV chefs make it look easy. But you, too, can make dinner on the run with a clear plan and a little prep time all in...30 minutes. :00 Snap the ends off your asparagus wherever they naturally break. Drizzle foil-lined baking sheet with oil and spread the asparagus and tomatoes on it, tossing them around to coat with oil. Sprinkle with salt and pepper and pop in the oven for 10 minutes. :05 Rinse the quinoa in a fi ne sieve under cool running water and put a medium pot of water on to boil. Pour the cream into a small saucepan and set it over medium heat until steaming. When the water comes to a boil, add the quinoa and set the timer for 15 minutes. :15 Pull the veggies out of the oven. Make room on the pan for the salmon. Lay it pink side up on the pan and spread the pesto over the salmon. Return to the oven for another 10 minutes. ● Put the walnuts or almonds into a small, dry skillet and set over medium-high heat. Shake it occasionally for 3-4 minutes, until they turn golden and fragrant. Set aside. ● Pour 1/4 cup olive or canola oil, 2 tbsp rice vinegar, 1 tsp honey and a pinch of curry paste or powder into a jar, screw on the lid and shake it up. :20 You can tell the quinoa is fi nished cooking when the germ separates from the rest of the seed. Drain it in a fi ne sieve, transfer to a bowl, add a handful of raisins and cover with a tea towel. This will absorb the steam and any excess moisture as it cools. 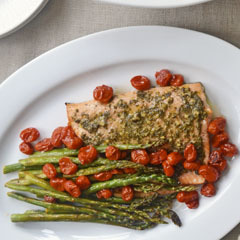 :25 Remove the salmon from the oven and arrange on a platter, surrounded or topped with the asparagus and tomatoes. If you like, drizzle with “a glug of” olive oil, Jamie-style. Cover with foil, shiny side down, and bring to the table. ● Remove the hot cream from the heat and add the chocolate. Set aside for a minute or two, then stir until smooth. :30 Scrape the chopped veggies and apple from your cutting board into the quinoa and toss to combine them. Drizzle with dressing and sprinkle with toasted walnuts or almonds. ● Pour the warm chocolate mixture into small ramekins or shot glasses and surround with chopped fruit, cookies, cake, or other fondue-friendly items for dessert. If you don't like all of these ingredients, don't worry. The elements of this meal are easily adaptable to suit the season, your tastes, or what you happen to have in your fridge. Don't like salmon? Try halibut, trout or another fresh fish. Cook for 10 minutes per inch of thickness. Don't like fish? Substitute a ham steak (or two); it just needs to heat through. Instead of pesto, stir together 2 tbsp each brown sugar, balsamic vinegar and grainy mustard, and paint it over the ham before it goes in. Not a fan of asparagus or tomatoes? Try roasting zucchini, trimmed green beans or cauliflower florets. Give them a head start in the oven before you add the fish. Customize your quinoa salad with your favourite ingredients. Add spring greens, cucumber or chopped peppers, or try slivered apricots or figs in place of the raisins. Fondue can be made with dark, milk or white chocolate – even leftover Easter bunnies! Any fruit, cookie or cake tastes delicious dipped in chocolate!